Austria’s southern most province. Kaernten / Carinthia is a mountainous province with many small and larger lakes, an Alpine summer paradise for hiking and water enthusiasts. Kaernten / Carinthia is also an favorite of avid skiers and Winter sport enthusiasts. Klagenfurt Guide , pop 92 000, 446 m.
Capital of Austria’s southern most province. Set on the banks of Woerthersee, has a picturesque historic town center with arcaded walkways, historic passages and courtyards that are now home to boutiques, bars and inviting beer gardens. 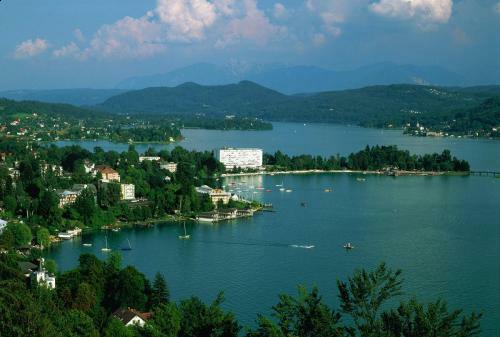 Klagenfurt enjoys a comfortable Mediterranean climate. Klagenfurt has many Baroque and Jungstil buildings. and Minimundus with 150 of the worlds most impressive buildings built to scale. Predominantly Alpine with the exception of the Klagenfurt basin – which also includes two of the largest lakes of the province – the Woerthersee and the Ossiachersee. 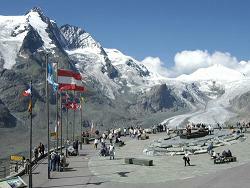 3979 m. The Pasterze glacier is the longest at 10 km long. The Weissensee ands Millstaeter See are also in the N.
Area was the center of Celtic kingdom of Noricum which became a Roman province 16 BC. Later invaded by Teutonic tribes, Avars, Slavs and Bavarians. After the breakdown of Roman rule, the Bavarians as with the rest of Austria became the dominant people of the region – attached to Bavaria by 8 C.
In 976 Carinthia / Kaernten became a Duchy - which included Steiermark, Karenten and East Tirol. In 1276 was passed on to the German King Rudolf of Habsburg. Light manufacturing,mining, forestry, tourism. Industry is centered in Villach, Wolfsberg and Klagenfurt. Timber is the most important natural resource supporting paper and cellulose plants. Other manufacturing includes metal products, chemicals and textiles. Agriculture and forestry are the principal economic activities each occupying more than 40 % of the land surface area. Most of the forest are privately owned. Livestock farming is dominant. Wheat, rye and oats are grown in the Klagenfurt basin and the Lavanttal, corn in the Gailtal and fruit along the lakeshores. The Woerthersee area is a chic home/ summer residence of many of Austrian cultural and business elites, a place to be seen. Would you like to visit Carinthia / Kaernten? available to purchase and download online. Our complete Travel Guides for Austria inc: many site-seeing ideas and options, tips, driving routes, directions and scheduling and much more to guide you happily on your ultimate self-guided self-driving tour !